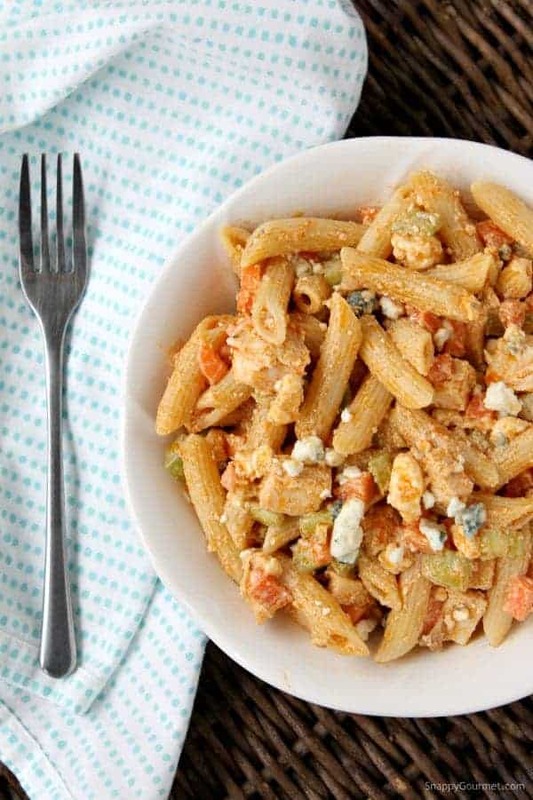 The BEST Buffalo Chicken Pasta Salad recipe! EASY homemade pasta salad to make with a quick vinaigrette, chicken, blue cheese, hot sauce, and veggies! BEST Buffalo Chicken Pasta Salad recipe with an easy buffalo vinaigrette type dressing (no mayo or heavy dressings), chicken, veggies, and blue cheese. As you may already know I love buffalo chicken recipes and all other buffalo type recipes. 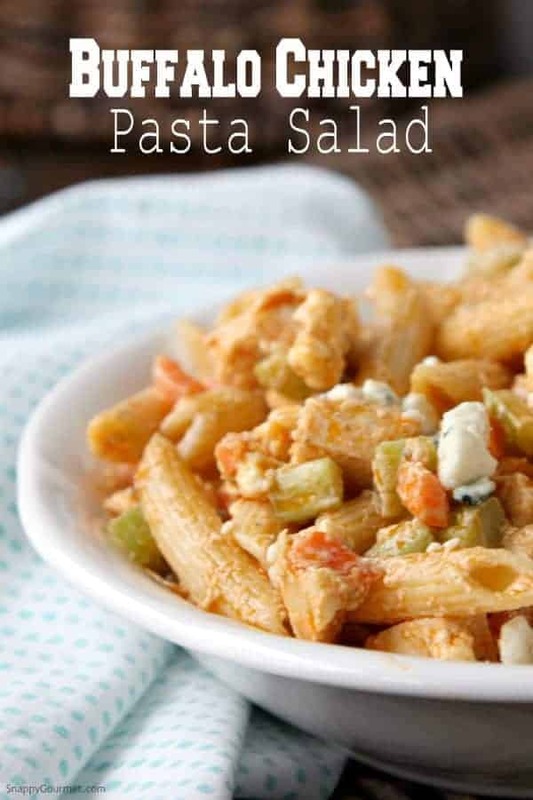 This easy Buffalo Chicken Pasta Salad is one of my faves! When I asked my Snappy Gourmet friends on Facebook earlier this summer for recipes they’d like to see, someone suggested an easy Buffalo Chicken Pasta Salad recipe so here you go. Unfortunately, we’ve been traveling a lot this summer so my cooking has been minimal (how many days until school starts up again??). I finally got around to this buffalo chicken pasta recipe this week! 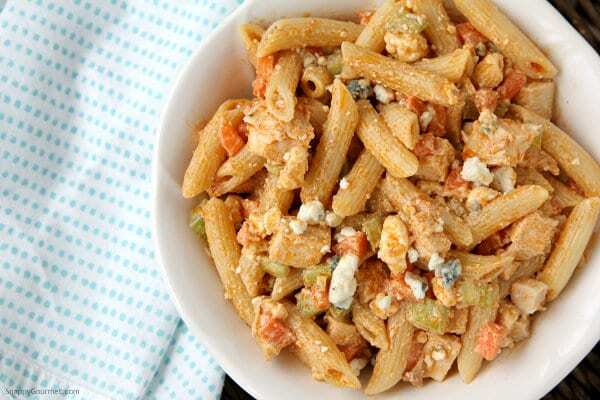 This Buffalo Chicken Pasta Salad has a light taste and would be great as a side dish or main dish. Perfect for dinner, tailgating, or a picnic and it’s great HOT or COLD. It would be great with shrimp, or skip the meat all together for a vegetarian dish. Use your favorite pasta shape and veggies and make it all your own! I love Buffalo just about anything as I mentioned! There are so many different kinds of hot sauces and many of them are great for different dishes. For “Buffalo” dishes, I like to use Frank’s Hot Sauce. It’s widely available and adds a real buffalo type flavor without being overly spicy. Instead of covering this Buffalo Chicken Pasta Salad with a heavy blue cheese dressing, I decided to make more of a vinaigrette dressing and add crumbled blue cheese to the salad. Adding a little Ranch flavored seasoning would also be a good addition to the dressing. This Buffalo Chicken Pasta Salad recipe turned out way better than I thought and definitely a keeper. Hope you enjoy! 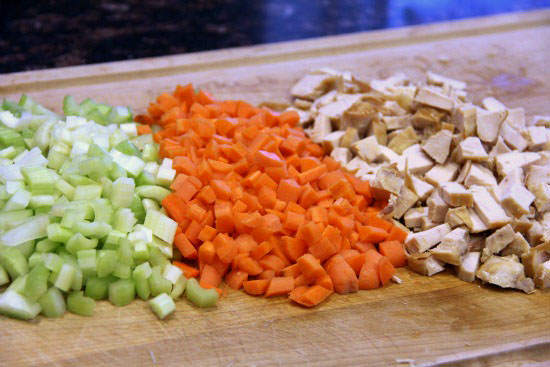 The only time consuming part of this recipe is cutting up the veggies. 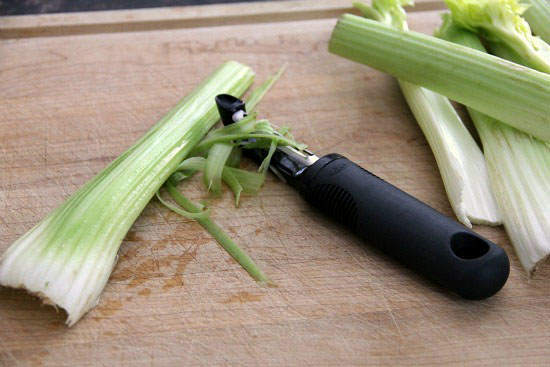 I like to peel the outside of the celery so that it’s not so stringy. A little tip I learned years ago. 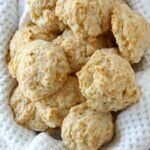 You can use any precooked chicken, but I like to use leftover precooked boneless chicken breasts. You could chop up a rotisserie chicken, substitute precooked shrimp (peeled and deveined), or leave the meat out all together. I would say the dressing is mild to moderately spiciness. If you want it spicier use less olive oil, and more hot sauce. Mix the pasta, veggies, cheese, and dressing all together. 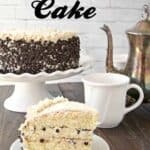 You can serve it right away, or refrigerate until ready to serve. If the pasta salad dries up a little after being in the refrigerator add a little more hot sauce and/or olive oil. 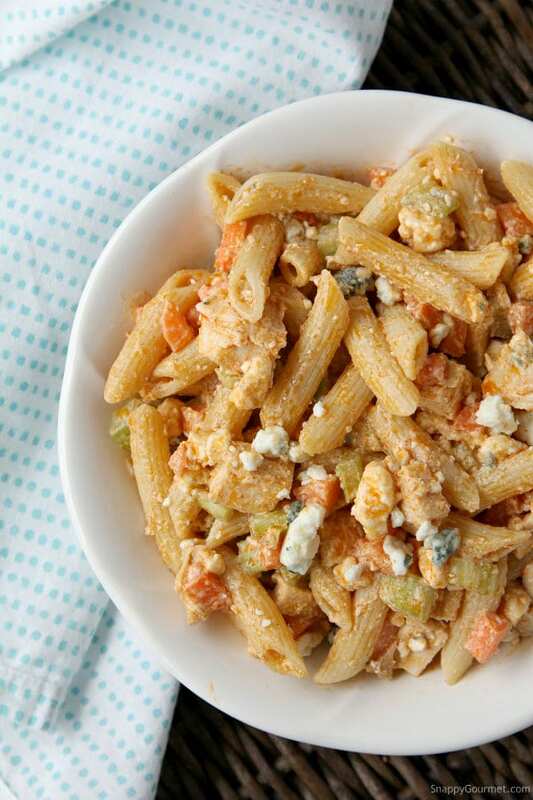 This Buffalo Chicken Pasta Salad is perfect for a picnic, tailgating, or potluck! Mmmmm…. Be sure to refrigerate any leftovers if you have any. Would love to hear about your favorite pasta salads! 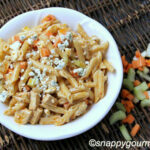 Hope you enjoy this Buffalo Chicken Pasta Salad! 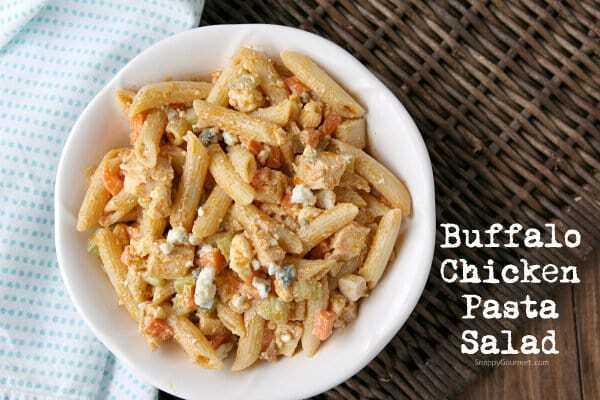 Buffalo Chicken Pasta Salad, perfect side dish or main dish for dinner, picnics, tailgating, or potluck. Cook pasta according to package directions to al dente. Drain and rinse thoroughly with cold water. 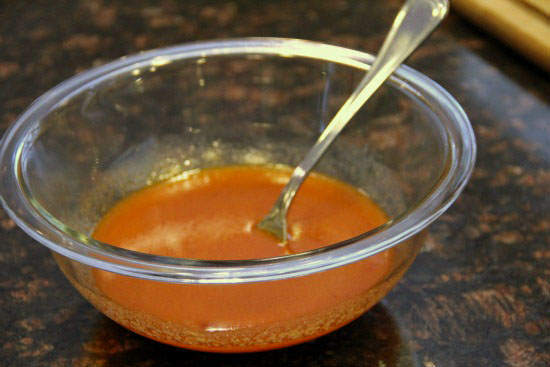 Meanwhile, whisk together hot sauce, oil, lemon juice, garlic powder, onion powder, and celery salt in small bowl until well combined. Place pasta in large mixing bowl. Stir in chicken, blue cheese, carrots, and celery. Slowly mix in dressing until desired amount. SNAPPY TIPS: You can serve this as a side dish or main dish and can be served hot or cold. 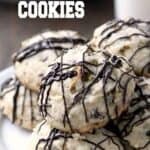 It would even be great for a tailgating or picnic potluck! It’s mild to moderately spicy. If you would like it to be spicier, use more hot sauce and less olive oil. If the pasta salad seems dry after being in the refrigerator, add a little olive oil or hot sauce. SNAPPY SUBSTITUTIONS: Use any shape pasta you’d like. Instead of chicken, you could use precooked small shrimp (peeled and deveined) or leave out the meat all together for a vegetarian option. A little ranch flavored seasoning mix would also be good in the dressing. Red onions and/or scallions would also be a good addition. 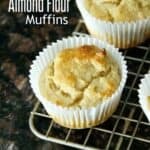 I found this recipe along with your Garlic Cheddar Drop Buscuits just the other day. 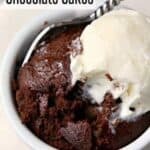 Today, in both the high school and middle school cooking classes I teach in a home school co-op, the kids made both recipes. What hits! Everyone loved it! The only thing we did differently was we used feta cheese instead of bleu cheese. 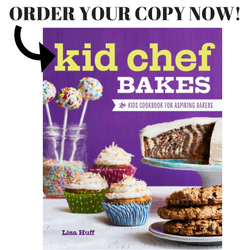 I’m sure we’ll be making more if your recipes in the future! Thanks! Ohh that totally makes my day, thanks Tanya! :) And a big hello to all your students! If I add the dry ranch dressing into the sauce would I not do the other seasonings? If you add the dry ranch seasoning mix you probably don’t need the other seasonings. Personal taste though. I’d start with a little bit of the ranch and taste it and adjust. Made this for a Super Bowl Party. It was a big hit, I added black beans and scallions. Thanks Brad! So glad you all enjoyed it! Great dish. Used to buy something similar at our local grocer but they dropped it. This dish is even better. I substitute yellow and red bell pepper for celery and carrots (personal preference) and added salami chunks alongside chicken. Doubled up on blue cheese as I am a big fan of it. Nice work! Oh yum!!! It’s now on my list! 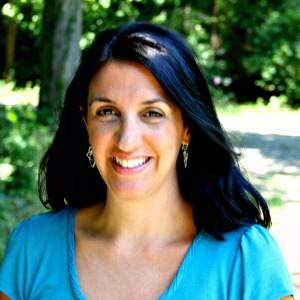 I love this recipe…I live in a suburb of Buffalo, NY and we love our Frank’s Hot Sauce. I am glad to see you use blue cheese and celery in your recipe..original sides of chicken wings. Can’t wait to take this to the next family picnic!!! 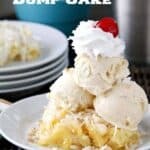 I made this recipe for a 4th of July Cookout and it was a HIT!!!! The only thing I did differently was shred the chicken… It was DELICIOUS!